Clostridium perfringens alpha-toxin is the major virulence factor in the pathogenesis of gas gangrene. Alpha-toxin is a 43-kDa protein with 2 structural domains: the N-domain contains the catalytic site and coordinates the divalent metal ions, and the C-domain is a membrane-binding site. 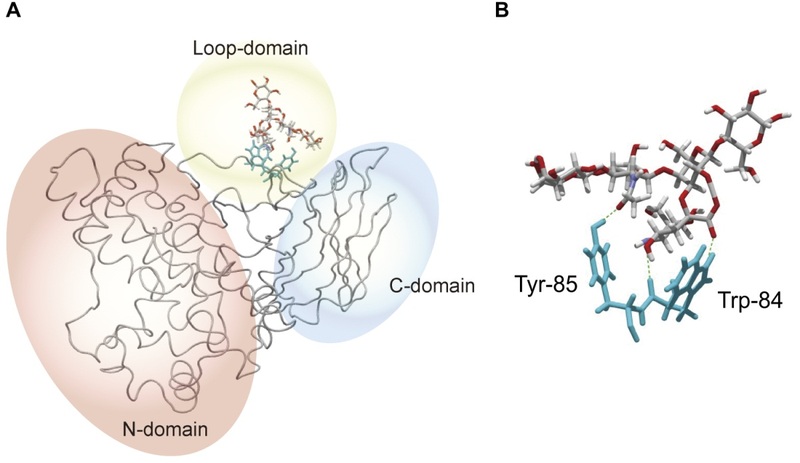 The role of the exposed loop region (72-93 residues) in the N-domain, however, has been unclear. Here, we show that this loop contains a ganglioside-binding motif (H…SxWY…G), which is the same motif seen in botulinum neurotoxin, and directly binds to a specific conformation of the ganglioside GM1a through a carbohydrate moiety. Confocal microscopy analysis using fluorescently labeled BODIPY-GM1a revealed that the toxin colocalized with GM1a and induced clustering of GM1a on the cell membranes. Alpha-toxin was only slightly toxic in b1,4-N-acetylgalactosaminyltransferase knockout mice, which lack the a-series gangliosides that contain GM1a, but was highly toxic in α2,8-sialyltransferase knockout mice, which lack both b-series and c-series gangliosides, similar to the control mice. Moreover, experiments with site-directed mutants indicated that Trp-84 and Tyr-85 in the exposed alpha-toxin loop play an important role in the interaction with GM1a and subsequent activation of TrkA. These results suggest that binding of alpha-toxin to GM1a facilitates the activation of the TrkA receptor and induces a signal transduction cascade that promotes the release of chemokines. Therefore, we conclude that GM1a is the primary cellular receptor for alpha-toxin, which can be a potential target for drug developed against this pathogen.